Happy Easter! The Christian world feels like this: ...because we've just come through Lent, Holy Week, the Sacred Triduum and the Easter Vigil. I love the Mass of the Lord's Supper on Holy Thursday, with the foot-washing and especially the Eucharistic procession to the altar of repose. But the moment of the Triduum that gets me --never fails to turn me into a blubbering idiot-- is the priest's prostration at the foot of the cross after the silent Good Friday procession (well, silent... except for the devastating military drumbeat they do at our parish: it strikes the heart). The stripped Church, the tabernacle empty, the mournful songs. Hard to take, but then they're redeemed by the glorious Vigil. Just a quick potpourri, then, because there's feasting to do. 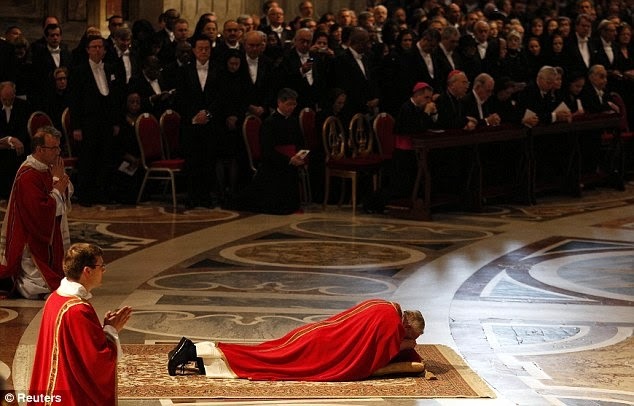 You can find transcripts of all the Vatican doings for Holy Week here, but you owe yourselves a read of two very fine homilies from Francis -- maybe his best all year. First, his words to priests at the Chrism Mass, about the joy of the priesthood. priestly joy is deeply bound up with God’s holy and faithful people, for it is an eminently missionary joy. Our anointing is meant for anointing God’s holy and faithful people: for baptizing and confirming them, healing and sanctifying them, blessing, comforting and evangelizing them. RTWT for more on that topic specifically, but it's also just a lovely reflection. Then there's his Easter Vigil homily, which is about the "personal relationship with Jesus." It's a very simple reflection on the post-Resurrection words of first an angel and then Jesus himself: "Go to Galilee and they will see me." What does it mean to go to Galilee? The remainder of the homily is a call to Christians to return to their personal "Galilee." Today, tonight, each of us can ask: What is my Galilee? I need to remind myself, to go back and remember. Where is my Galilee? Do I remember it? Have I forgotten it? Seek and you will find it! There the Lord is waiting for you. Have I gone off on roads and paths which made me forget it? Lord, help me: tell me what my Galilee is; for you know that I want to return there to encounter you and to let myself be embraced by your mercy. Do not be afraid, do not fear, return to Galilee! The Gospel is very clear: we need to go back there, to see Jesus risen, and to become witnesses of his resurrection. This is not to go back in time; it is not a kind of nostalgia. It is returning to our first love, in order to receive the fire which Jesus has kindled in the world and to bring that fire to all people, to the very ends of the earth. Go back to Galilee, without fear! UK: Perhaps you saw this on my twitter feed earlier this week, but it's too good not to call attention to it again. Damian Thompson finds people who've become Catholic because of Richard Dawkins. (Don't laugh, but I became convinced of the value of chastity during my doubter/atheist phase because of Woody Allen.) Anyway, an excellent Easter story.